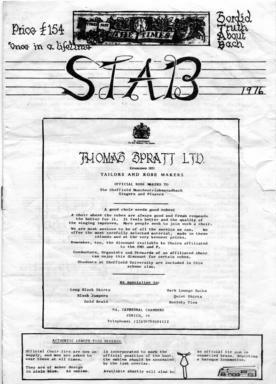 This news-sheet provides vital and previously undisclosed information on musical and unmusical activities of the Sheffield Bach Society in ancient time. The document well illustrates the deficiencies of the oral and written historical musical records; much of it is almost incomprehensible to anyone not present at the time and place, and not yet in their dotage. Like all the other documents ever published about JSB, this one provides absolutely no insight into vital questions, such as how he dotted his crotchets. However, the centre-page spread notwithstanding, today's readers will discover that certain themes are universal. The newsheet was reputedly closed down by the government after an archeologist at the University, who was researching the odour components of the straw in the hassocks at Sheffield Cathedral, discovered a medieval hacking device. The Sheffield Bach Society, directed for many years by the late Dr Roger Bullivant, was a pioneer of the Historically-Informed Performance (HIPster) movement. Driven by the economic difficulties of the time, some unfortunately influential musicians had proposed that choirs should be reduced to a bunch of untrained soloists with one weedy voice per part. Notwithstandin,g that proposition, JSB's employer took the trouble of paying for a 60-strong choir school. The Sheffield Bach Choir had a slightly larger number of members, though none were of school age. Both JSB and Roger sometimes complained about the standard of their human resources, no doubt to antiicipate difficulties with attaining their Key Performance objectives. The Sheffield Bach Choir was decidedly historically uninformed; they were never able to sing fast enough. However, numbers did diminish spontaneously to HIPster levels for performances of commissioned and other contemporary works. Geographical factors must be considered when interpreting the document. For example, Italian readers won't immediately understand the references to tenors. In more Northern climes it isn't too difficult to recruit a goodly bellow of basses, but for tenors one must rely on quality rather than quantity. In some countries, football (known in the USA as soccer) is a pastime mainly for ladies and Mr Beckham. In Sheffield and much of Europe, it is generally accepted that the sport is more important than life & death, and even than getting to sing in all the Bach cantatas before one dies. Each major conurbation has numerous football teams that play in major competitions. Sheffield has two that did once play in such competitions. Greater Paris is an exception to this rule, having only one institution that meets a few of the relevant sporting criteria. This is not really an oversight: the region has more than its fair share of opera houses, which are a bit like posh football stadiums as far as a collective activity sometimes referred to as singing is concerned. It has been difficult to identify the cultural influences behind the English footballing scene. Scholars appear to have neglected some rather obvious references to Bach's cantatas, lost or found, mostly lost. Examples are: 'The first shall be premier and the third shall be first', 'Give the angry man thy ball', and 'He nivvor hath touched him, Lord'. The latter, known as the Geordieland Cantata, has never been performed in Sheffield on the grounds that the religious works should be given in a language that at least some members of the audience or congregation can understand.